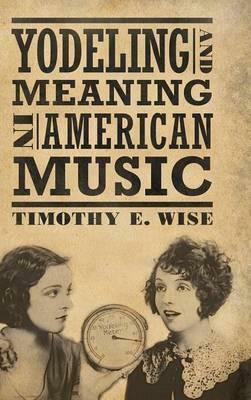 Timothy E. Wise’s Yodeling and Meaning in American Music has one of the best titles I have seen in academia, though the content is an example of thorough musicological investigation in a familiar form, it is outstanding in this (non-trivial) aspect. A book should always have a good title, perhaps especially when dealing with a subject matter that is not commonly taken seriously. During my reading of this book – and writing of the review – I had a good deal of talks with people about yodeling, what it is and is not, and what it means. However, before I get further into this review, I would like to take a moment to explain the Spotify playlist that is a part of this review. The examples in this are (most of) those mentioned in the first chapter of Wise’s book. As this is the chapter where the project is outlined and the author settles on his terminology, the examples span more than a hundred years of songwriting and shows some of the scope of the work, as well as the breadth of the types of yodeling one can find. One song (the first) was my own addition, chosen to provide some context for my own presumptions and those of my conversation partners about yodeling. This playlist is not merely exemplary, it also helps to illustrate the musicality that runs through Wise’s work. It is a book deeply about music, grounded in musical expressions and semiotics, but also in music history, and not least the meanings we ascribe to musics and how these change. Sections of the playlist warrant a special mention, as these were the songs which came to signify parts of the book for me, getting stuck on repeat in my head even when the book was not at hand. During the first chapter, I found myself humming Gabrielle’s “Out of Reach” quite a lot, and it is indeed one of the examples in that chapter, an example which helps problematise and dispense with some of those aforementioned presumptions. Aside from a cornucopia of songs included, Wise opens with an explanation of what specifically he means by yodeling, a classification of types of yodels, and the introduction of a word I never knew I needed: yodeleme; the sound that signifies a yodel. This is one of the defining ways Wise tracks the development of yodeling, and this almost forensic style examination of the soundbites that make up different yodels over history is captivated reading. After the first chapter, the book is roughly chronological, but also thematic. It tracks yodeling and what it signifies over more than two centuries, including how yodeling travelled to the USA, how it became a music related to rural settings, and to cowboys, while still keeping track of how yodeling also developed musically, including a discussion on race and racism. Interestingly, the final chapter is devoted to how we came to consider yodeling a joke, though Wise has touched upon this earlier. His tracking of yodeling is a journey from so-called “high” culture to “low”, from “classical” to “popular”, and from Europe to America. This last chapter diverted my mental playlist to Disney’s Snow White. As I mentioned, I had several conversations during my reading time, which were a defining part of the experience of the work, as was, of course, the playlist I dove into while I read. These conversations often started with jokes, or with utterances of sympathy for my having to deal with the subject. To answer all of these, I found myself explaining the yodeleme, the vocal technique, even going so far as to demonstrate bits of songs with yodelemes in them; quite often these were Hank Williams songs, which is interesting on a personal level as his was my only solid understanding of American yodeling music prior to reading this book. In general, I stood up for yodeling while reading, defending the subject as valid, as well as the art of yodeling itself. And as the playlist shows, the stereotypes I had conjured prior to reading are just that. The yodel is far more used and far more varied than I, at least, imagined. The simple fact that I became a defender of the yodel, and intend to keep that work up, is proof that Wise has written a book that does what it sets out to do. Sympathy such as that which I now feel can only come with proper understanding, and Wise’s work provides that. I had planned to learn to yodel as I read the book, but instead I learned that I already could. Now my next step is to get better at it, so I can mount a more nuanced defence next time I am in a discussion that calls for some yodels. Book Review – “The Beatles”, Ian Inglis.